Don and Pam Moore, one of Coco Plum’s first guests were “wanderlusters” long before wanderlust was even a thing. Together, their desire to encounter an authentic cultural experience marked the beginning of a deep relationship with Belize, Coco Plum, and with their hosts. Here, Don reveals his unique discovery and return to Coco Plum Island Resort between 2003-2015. One of the great pleasures in travelling is the potential to discover something breathtaking and unlike what you have seen before. My wife and I’s first trip to Coco Plum Island Resort was a paradise found. If there are such things as luck, it was surely shining upon me as several factors came together to lead me to Coco Plum and our hosts. We decided to visit Belize on the recommendation of a business friend of mine who had often travelled there. We were looking for a resort that would provide a tropical environment, a fishing experience, swimming, snorkeling, a Maya ruin experience and seclusion. While we had scoured the travel guides searching for just the right resort, the only mention of Coco Plum was found via a search of the Internet. An e-mail inquiring about the amenities was responded to quickly and each inquiry about available weeks to book on the island were met with a favorable response – “Sure we have room, come any time” was the reply. Off to Belize we went, hoping for the best. To further enhance our adventure, we decided to take the public bus from Belize City to Dangriga Town. We arrived at the bus station in Dangriga where were instructed to call when we arrived. Imagine our surprise when the only pay phone was out of order. Now facing a traveler’s dilemma, I inquired about borrowing a telephone to make a call. Luckily, the person I spoke with was the brother-in-law of Michelle, the person I was supposed to meet. We were offered a ride to meet her and soon headed down a road that looked as if would end in a jungle where I was sure we were to be robbed and left for dead. Thankfully, we were taken precisely to Michelle’s home and offered refreshments while we waited for her husband, Emilio, to come from work and greet us. Thus marked the beginning of a great friendship and exploration of Belizean culture. As we boarded the boat to travel to the island, we were told that there were no other guests that week and the owners would be accompanying us to the island and stay the evening. To our complete amazement, we had the run of the entire tropical island to ourselves! For the next seven days, we lived in paradise with no phones, no newspapers, no TV, no radio, no cars or driving, and a wonderful service staff. We happened to be among the very first guests on a private island paradise. 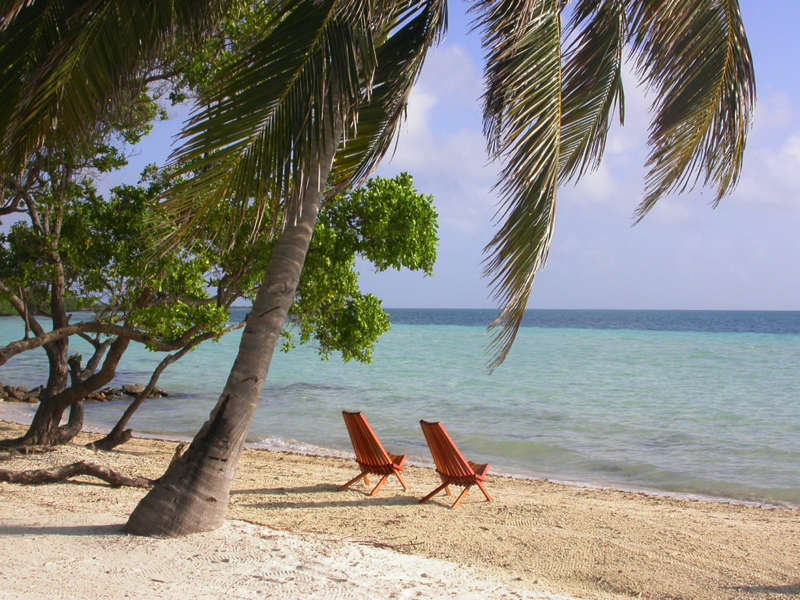 Don and Pam arriving in Coco Plum Island Resort, Belize! Forgive me if I gloat about being one of a handful of people who have experienced Coco Plum Island in this manner. It was that wonderful, but all things change and Coco Plum is no exception. Since my first trip to Coco Plum, I have returned five times. Although the island has grown in size, amenities, and service offerings, the vision remains the same. Coco Plum is still private and secluded, with individual cabanas that allow for a relaxed but luxurious atmosphere, perfect for romantic getaways and destination weddings. Guests are able to experience the full range of tropical island and mainland adventures while enjoying the warmth and hospitality of Belizean culture. Below are some comparison photos of my earlier travels to Coco Plum in 2003 to my most recent trip in 2015. Coco Plum vegetation and landscape – then & now! As much as things can physically change, some parts of the Coco Plum experience do not. For example, Robert is still an expert captain and fisherman – fishing trips remain a delight at Coco Plum where you can return to the island with your catch and have the fish prepared to eat! Lastly, while the docks at Coco Plum have become larger, the sunrise and the beauty of the island remain. This is the sunrise in April 2005. Maybe you have been lucky enough to witness a few or two! We hope you enjoyed an insiders scoop from one of Coco Plum’s first guest, Don Moore. Thanks for sharing Don!